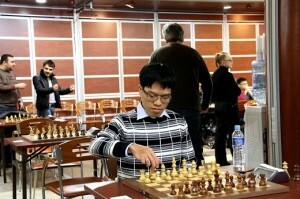 Vietnamese star Le Quang Liem has made his first draw of the tournament on the 4th round. GM Gadir Guseinov from Azerbaijan decided to repeat the position even though he had a better position with the white pieces. Le had a not so difficult first three rounds, getting his 3 wins in less than 30 moves. He showed once again that his opening preparation is first-class; thanks to this, he defeated his lower rated opponents in the early middlegame. However, the 4th round game was slightly different. Guseinov got the initiative on the kingside in a French Defense where black chose tho take out his “bad light-squared bishop” to b7. With his king’s protection diminished, Le started to look for simplifications and, when it was clear that white’s position was preferable, Guseinov decided to make a three-fold repetition, showing respect for his strong opponent. Le faces Pavel Ponkratov on the first round. Guseinov will play the second seed, French GM Laurent Fressinet.